Hey Real Housemom readers! 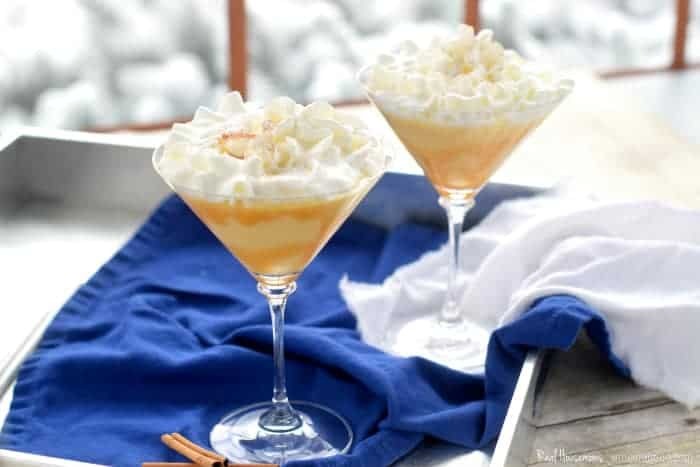 I’m back, and this time I brought a really fun drink that is perfect for the holidays! In my head, I’m the sort of Martha Stewart entertainer who has beautiful holiday decorations up, perfectly dressed children who quickly go to bed during the party when the time comes, and a delicious signature drink for the party . . . In reality, none of my friends can get sitters, my children are always covered in stains, and when I’m drinking it, it is with my feet up after the kids are in bed ignoring the dishes in my sink. Ha! It seems like whenever I’m making a martini for the blog . . . they turn into epic, ginormous dessert martinis. Covered in whip cream and ridiculously delicious. And this bad boy is no exception. 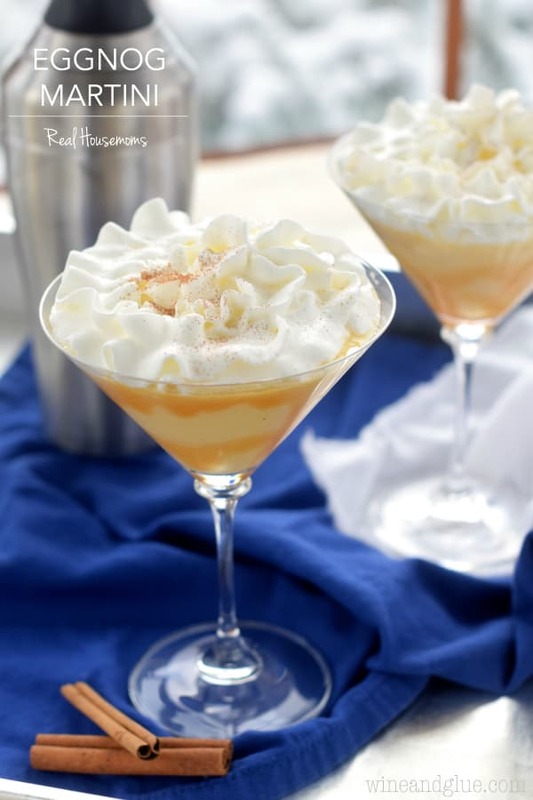 This Eggnog Martini is made with this amazing cinnamon simple syrup. I’m convinced that it is what makes the drink so delicious. 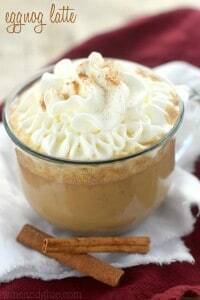 When you add to that caramel syrup that you drizzle the glass with, and then the topping of whipped cream and a little cinnamon . . . I mean, all I’m going to say is skip the pie at the holiday party, and go for this martini! It’s totally worth it. So whether this is your signature drink with your friends at your fancy party or your signature drink for pajama-ignoring-the-dishes time . . . . Winning. This Eggnog Martini is easy to make and will put you in the holiday spirit faster than you can say "Ho! Ho! Ho!" Over medium heat combine the sugar and water and bring to a boil, stirring consistently. Once the sugar is dissolved, remove from the heat, and stir in the cinnamon. Let cool completely. Mix together the eggnog, vodka, and simple syrup. 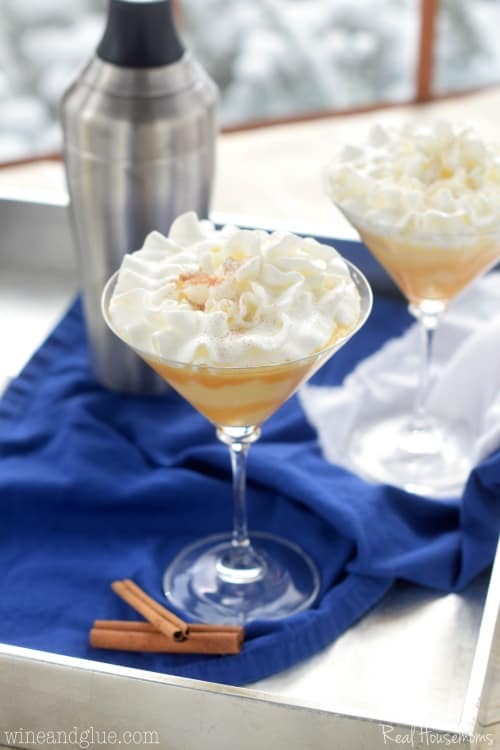 In a martini glass, drizzle the caramel syrup. Gently pour the martini over it. 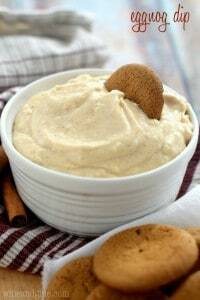 Top with whip cream and cinnamon.